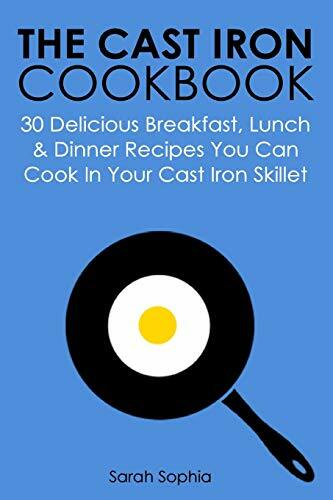 [PDF] The Cast Iron Cookbook: 30 Delicious Breakfast, Lunch and Dinner Recipes You Can Cook in Your Cast Iron Skillet | Free eBooks Download - EBOOKEE! Description: Learn to Cook Delicious Meals With Your Classic Cast Iron Skillet If youâ€™ve ever cooked with cast iron cookware then you will know the satisfaction it brings. Despite all the technological advancements that have come along in kitchenware, the cast iron pan remains a classic. Adored by chefs around the world, cast iron pans are unparalleled for cooking with. No over pan gives the same even heat distribution and if youâ€™re looking to cook restaurant quality food then you need to use a cast iron pan. Despite how amazing cast iron pans are, they remain very low cost whilst lasting for many, many years. So there is really no reason you shouldnâ€™t be cooking with one! In this book you will learn to cook absolutely delicious meals in your cast iron skillet. All 30 recipes have been specifically designed for cooking in a cast iron skillet, your friends and family will love them all. The ability to transfer your pan back and forth between the oven and stovetop opens amazing cooking opportunities and thatâ€™s what this book is about. No comments for "[PDF] The Cast Iron Cookbook: 30 Delicious Breakfast, Lunch and Dinner Recipes You Can Cook in Your Cast Iron Skillet".